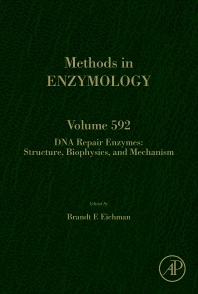 DNA Repair Enzymes, Part B, Volume 592 is the latest volume in the Methods in Enzymology series and the first part of a thematic that focuses on DNA Repair Enzymes. Topics in this updated volume include MacroBac: New Technologies for Robust and Efficient Large-Scale Production of Recombinant Multiprotein Complexes, Production and Assay of Recombinant Multisubunit Chromatin Remodeling Complexes, Analysis of Functional Dynamics of Modular Multidomain Proteins by SAXS and NMR, the Use of Single-Cysteine Variants for Trapping Transient States in DNA Mismatch Repair, and Structural Studies of RNases H2 as an Example of Crystal Structure Determination of Protein-Nucleic Acid Complexes. Dr. Eichman is a Professor of Biological Sciences and Biochemistry at Vanderbilt University, where his laboratory investigates the structural mechanisms of protein machines involved in maintenance of genome integrity. Professor Eichman was initially trained as a synthetic organic chemist at the University of Mississippi (B.S., Chemistry, 1993). He received his Ph.D. in Biochemistry and Biophysics in 2000 from Oregon State University, where he used X-ray crystallography to study the effects of crosslinking agents on DNA structure and determined the landmark structure of the Holliday junction, the four-stranded DNA intermediate formed during genetic recombination. As an NIH postdoctoral fellow from 2000-2004 with Tom Ellenberger at Harvard Medical School, Eichman studied the structural enzymology of DNA repair and replication proteins. Current projects in the Eichman lab focus on base excision repair of DNA alkylation damage and restart of stalled replication forks during the DNA damage response. Dr. Eichman holds the 2009 Young Investigator Award from the Sigma Xi Scientific Research Society, the Vanderbilt Chancellor’s Award for Research, two Vanderbilt-Ingram Cancer Center Impact Awards, and in 2013 became a member of the Faculty of 1000. Eichman teaches introductory and advanced undergraduate biochemistry and serves as the co-Director of the Vanderbilt Undergraduate Program in Biochemistry and Chemical Biology.